Beginner Chess:This class is open to everyone who is new to chess and wants to learn the basics in a fun and friendly environment. Students will learn how all the pieces move and how to checkmate. They will be introduced to opening principles and various phases of play. Students will also be taught chess notation and use of the clock. Recommended range is unrated to USCF rating <500. Students will be grouped based on ability. Intermediate Chess:This class is intended for students who know the basics of chess and want to advance their knowledge. Students will be expected to have some scholastic tournament play experience. Knowledge of notation and chess clock is required. Students will gain a deeper understanding of openings, and get an introduction to middle and end games. They will focus on tactics and puzzle solving, and play tournament style games with analysis. Occasional homework may be given. Recommended for players with a USCF rating > 500. Students will be grouped based on ability. FM Jovan Miletic, founder of Chess Focus,is a chess Master and has done after-school programs at NEST+m and other schools for many years. He is an enthusiastic teacher and loves working with kids. This class is intended for advanced chess players with an USCF rating of 800+ and is geared for players who represent NEST+m at major local and national tournaments. The focus of this class will be on advanced tactics and strategy. 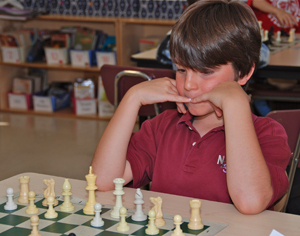 Students will gain a deeper understanding of middle and end games. Students will also be introduced to the history of chess and famous games from chess world champions will be analyzed. The class will include tournament style play with game analyses. Regular homework can be expected.